The first misconception to discard when grappling with modern feminism is the proposition that feminists are opposed to patriarchy — patriarchy being defined as the woman’s reliance on men for protection and provision. Modern women are no less reliant on men for protection and provision than they were in prehistoric times. They merely achieve it through more indirect and institutional means, so they can afford to be far less agreeable. Rather than cry for a hero on a trusty steed when endangered, they dial an officer in a Crown Victoria. Rather than applying charm and grace to woo a suitor into providing for her, she uses votes and lobbying networks to influence the government into extracting wealth and privilege from the males she’s never met and will certainly never kiss. 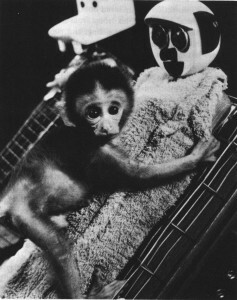 In psychologist Harry Harlow’s notorious experiments  in primate psychology, he simulated one monkey from wood and wires which provided nutrients and created beside it another adult monkey from cloth which did not provide nutrients. The infants overwhelmingly preferred the fuzzy monkey with its “contact comfort” over the wire monkey, only visiting the wire monkey long enough to feed. Metaphorically, the government and its derivatives are the wire monkey and we actual men are the fuzzy monkey. Even when we can compete with the system’s copious protections and provisions, our services are largely superfluous. And we still typically insist on loyalty, fidelity, and obedience in exchange for these services they can obtain elsewhere for free. While the protection and provision is originally plucked from our hands, the hand that feeds is the system. Even though I’m the one who purchases the cat food, our cats are loyal to my daughter rather than to me because she’s the one who directly feeds them. Even though White middle class males are creating much of the wealth that Obama redistributes to women through his cornucopia of programs, they’re loyal to him because he’s the face of the system protecting and providing for them. After all, the welfare handouts are called Obamaphones, not Whitemaletaxpayerphones. Somebody willing to depart from Traditionalist principles might argue that the current regime renders equal and independent what nature would make hierarchical and dependent. The problem with that is a woman’s natural and instinctive loyalty to her protectors and providers creates a dissonance in the modern age between her compulsion to procreate with her patriarch and the fact that they’re not actual or accessible human beings. In a welcome departure from Kenyan political tradition, Barack Obama has chosen to abstain from impregnating the untold millions of women who would jump at the opportunity for hypergamy. Unless this dynamic is reversed, our birth rate will continue to hover at its currently unsustainable nadir. While this analysis may seem insulting and dehumanizing to contemporary women, contemporary men are in a sense even more pathetic. Women are, after all, benefiting from going along with the current arrangement while the men are going along almost as eagerly while being played for suckers. The general pattern up until very recently has been for men to continue desperately going through the traditional motions of chivalry, courtship, marriage, protection, and provision while no longer being valued, respected, or rewarded for doing so, but an increasing number are adopting “Game” and Men’s Rights perspectives which empower them within the current context. Even a good share of men who aren’t directly and explicitly introduced to these heretical counter-currents are intuitively wandering off of the treadmill and opting out of the status competition and resource acquisition activities which no longer result in a dating market advantage worth the exhaustive effort. We “white knights” can’t continue mindlessly going through traditional motions of chivalry and loyalty. Carrying on a fantasy of defending the dignity of ladies is absurd in the absence of dignified ladies. It’s worse than a foolish waste of time; it’s a necessary precondition for feminism and decadence to continue. A remnant of exceptional women will continue being loyal to their rightful protectors, providers, and patriarchs, yet most women will be tempted to hop back and forth between the wire monkey of state largess and the fuzzy monkey of “nice guys” as long as circumstances enable them to do so. If she’s Modern, respect her demand for equality by letting her open her own pickle jars, change her own tires in the rain, move her own furniture, and walk herself home. This capitalist system and its welfare state has contraptions, AAA memberships, and cops for all these things. While it’s well and good to advise young men to stop being played for suckers, it should not be at the expense of the ideal. Even if contemporary Western women are a veritable army of obnoxious and entitled castrated little men, it’s not supposed to be that way and doesn’t have to be that way. For all the (entirely understandable) complaining throughout the New Right and the overlapping “Manosphere,” women are being set up by liberalism for a terrifying future. It may appear right now that they’re winning this “gender war,” but there’s only one way this can possibly play out. They’re blind to the artificial supports propping up their independence and economic success. They take these institutions supporting them for granted. Finally, they take male chivalry for granted. While there’s likely an innate inclination, chivalry must still be developed and encouraged. It’s something which can be beaten out of boys by decades of female aggression, intimidation, and hypergamy–and it largely has been. The “too big to fail” institutions supporting them will fail them, and what incentive do modern men have to catch them? The very rough and unfortunate circumstances of young women in Eastern Europe  after the fall of Communism is a useful of indication of things to come . . . only the economic crisis will be worse, the culture more degraded, and there will be a great deal of racial strife. The “traditional” churches won’t be of any use, as they’ll have all that much more third world grief in their lap to encourage and ingest. And there won’t even be a West to mail-order themselves off to! Perhaps some men’s rights types will chortle at this comeuppance, but my goal is to end the gender war that feminists started, not turn the tables or settle any scores. Had we been afforded the identical opportunity of taking what we want from women when we want it without asking for permission, and had we been told by the whole world in chorus that we had every right to do so, I suspect we men would have proven no less despicable. The only legitimate “us and them” identity group designations are between families, nations, and races . . . not between the male half of white families, tribes, and nations. The New Right will inevitably appeal primarily to males for the foreseeable future, as we’re offering women definitively less than Modernity appears to offer. We Traditionalist men are demanding loyalty and even submission in exchange for protection and provision they can enjoy for free and at their leisure from the wire monkey. I’m a “white knight” at heart, and I live every day for the women in my life and the women on my side. But I do expect them to make a choice: Me or Modernity.